We are Manhattan Rickshaw Company, currently the longest operating pedicab company in New York City...transporting New Yorkers and visitors since 1995. In addition, Manhattan Rickshaw Company is a founding member of the pedicab trade association created to develop best practices in the industry (see: www.nycpoa.org or click on the NYCPOA logo on our home page). Thank you New York, and thank you to our drivers! 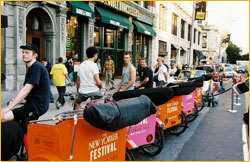 A word about the pedicabs: Manhattan Rickshaw Company is a one-design fleet, using a time-tested design from one manufacturer featuring state of the art 21-speeds with lighting (for night riding) and canopies in the event of rain or needing to escape unwanted media attention. 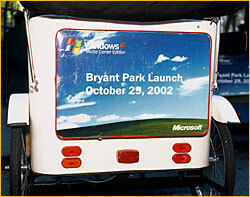 Manhattan Rickshaw has always 1) trained its new drivers (all drivers have motor vehicle operator licenses as a plus); 2) provided liability insurance for the vehicles, passengers and drivers; and 3) worked with the city whenever asked to develop the industry. We think this is important, and we don't cut corners (unless we have the green light). Increasingly clients are asking us about transferring their corporate event groups or special event attendees from one site to another; and we say yes, this is a great idea, for team building, for a moment to talk about later over dinner, for a memorable and price-competitive mode of transport. No one compares notes Monday morning on how a motor coach seat was more exciting to sit in than another, but a pedicab seat offers a world of its own. May we offer your group a ride? Additionally, we are always looking for ways to expand driver creativity and involvement, from wearing branded apparel to promoting your event. 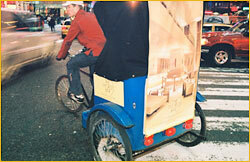 Pedicab drivers, who are independent contractors, will work with you on a pre-arranged basis for your next project. 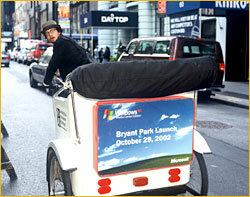 That's why pedicabs are known as "performance media." If you are looking for more information about any of the preceding, please contact us. About: Please wait for your driver to pull over to the curb. These rides are on-demand rides, for two people at a time. About: Want to take out your partner for dinner, pick up a co-worker for a surprise lunch, or book an open air tour of NYC? Please call (212-604-4729) or contact us. 24 hours' notice is truly preferred. A driver will contact you to finalize. Pricing: Price will be arranged with the driver. 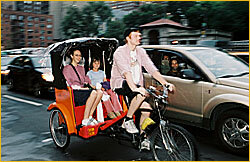 About: if you have a large group to move from point to point, such as from a wedding to the reception, or from a hotel to your group destination, consider pedicabs. We have handled large tour groups, corporate functions, private parties, and smaller family get-togethers. Rides that travel through Central Park will require obtaining a group permit in some cases. Longer notice is required for these larger group transfers. Pricing: Contact us for pricing information. 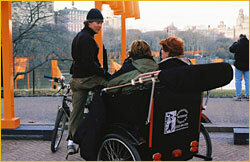 About: We are developing professionally guided tours. We have an urban planning student in our driver roster who is a licensed NYC tour guide. Let us plan a custom tour for your group or you and your best friend. Coming soon: audio tours and cab-to-cab audio! About: We call this "performance media," which incorporates a decorated pedicab with your branding message and a trained driver providing complimentary service to your guests and VIPs. Ask us about bundled hourly rates, weekly and monthly packages including quotes from our team of production vendors. Pricing: Contact us for pricing information. .
About: This is our catch-all category of service, from helping film crews transport talent and equipment (we helped the documentary crew that filmed "The Gates" in Central Park, for example) to actually being in the shoot (we were in the first season of "The Apprentice" and have been part of many film shoots, from MTV to the Discovery Channel). Pricing: Rates vary by assignment. Contact us for pricing information.